I have noticed on an American based NC700X forum that I participate in that a lot of riders have colorful American maps in their signature line. These maps are colored to highlight where they have traveled on their motorcycles. The images are created by a website, visitedstatesmap.com, that automagically colors the image for you. 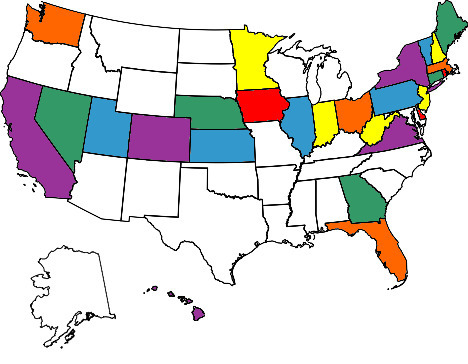 You just tick off the states you have been to on your bike and the site produces a colorful image for you. Unfortunately, I have not had much luck finding something similar for Japan. As such, I had to hack one together myself. 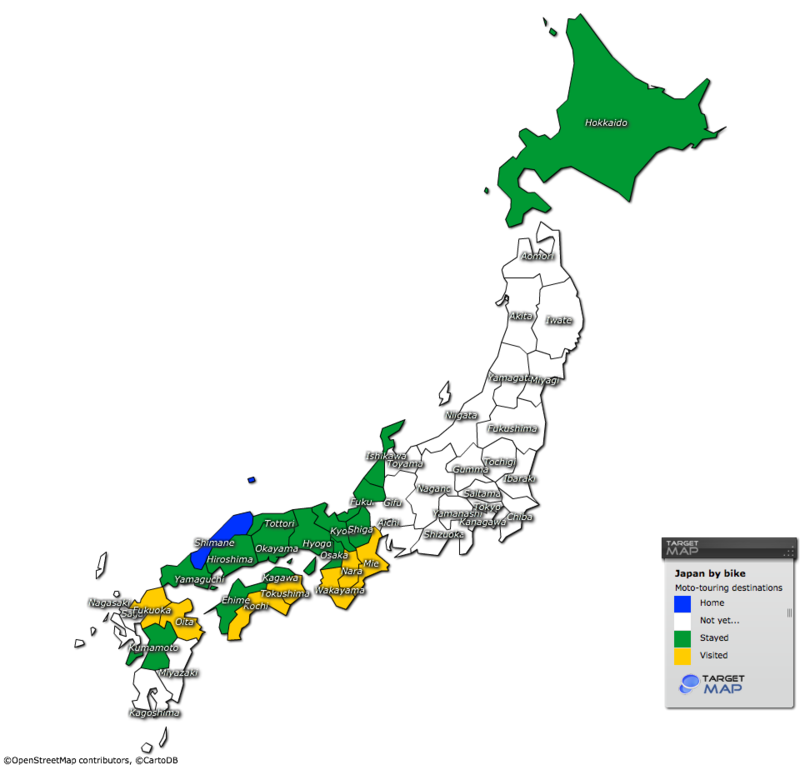 I spent more time on this than I care to admit… Between searching for the best map to use, removing all the color fill, retyping all the prefecture names, and recoloring it I spent the better part of an afternoon/evening on it. So far I have only overnighted with my bike in seven other prefectures besides Shimane, and toured through five more. I have probably ridden in Hiroshima as much as in Shimane, as most of the good roads in the mountains around here go back and forth between the prefectures, but until I pop a tent on that side of the mountains Hiroshima will remain yellow. So far I have ridden all of the Chugoku region (Yamaguchi, Shimane, Hiroshima, Tottori, Okayama), all of Shikoku (Ehime, Kōchi, Kagawa, and Tokushima), and almost half of Kyushu (Fukuoka, Kumamoto, and Ōita). I think that by the end of my upcoming Hokkaido trip, I will add ten more prefectures to the map, three of which will be overnight stays. I am really looking forward to filling this map in completely over the next few years… Wanna go for a ride? So you will ride up to Hokkaido and back? Yes, that is kind of the plan, but there are ferries involved as well. I am riding from Shimane to Kanazawa to meet my friend Gary on the fourth,and from there we will ride across Honshu to Sendai. We will then take a ferry from there to Tomakomai. We will spend about a week riding around Hokkaido and then we will take a ferry from Otaru to Tsuruga. 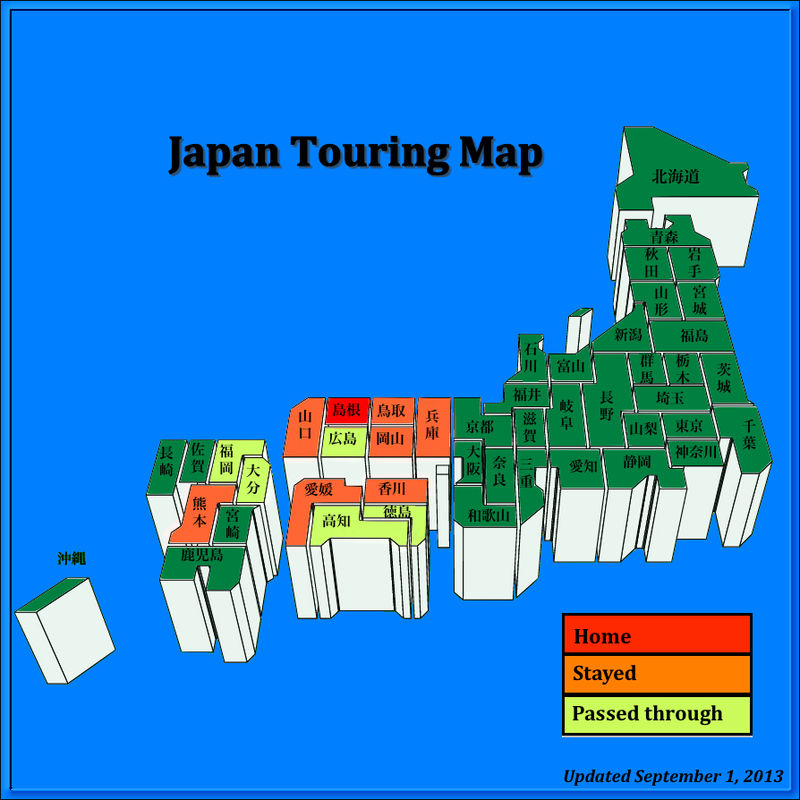 I should be getting back in Shimane on the 17th or 18th. From Tomaokomai, there is a cycling road up to Lake Shikotsuko and a great campsite right on the lake. The cycling road is a gradual uphill all the way with hardly any up-downs. I think at least part of it was an old railway track. You can easily make it before dark from when the Sendai-Tomakomai Ferry arrives, even if you take a bit of time doing a little shopping. Thanks for the tip. We are actually planning to impose on Mr. Hagley in Muroran on our first night. It is a short hop from the ferry landing and he promised us a traditional Aussie BBQ, so it was an easy decision. We may be swinging back past Tomakomai on the flip side, so I will keep this spot in mind.